We’re so grateful for the support of people in Pittsburgh who reached out to help us and we’re proud to be part of the big movement to make UPMC act like a real charity. We stood up to UPMC and we won. 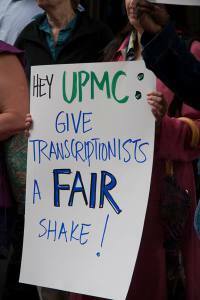 I’d like to share some good news about the medical transcriptionists UPMC abruptly laid off last year. I’m one of them. The state Unemployment Compensation Board of Review found that a group of us who filed for unemployment are in fact eligible. 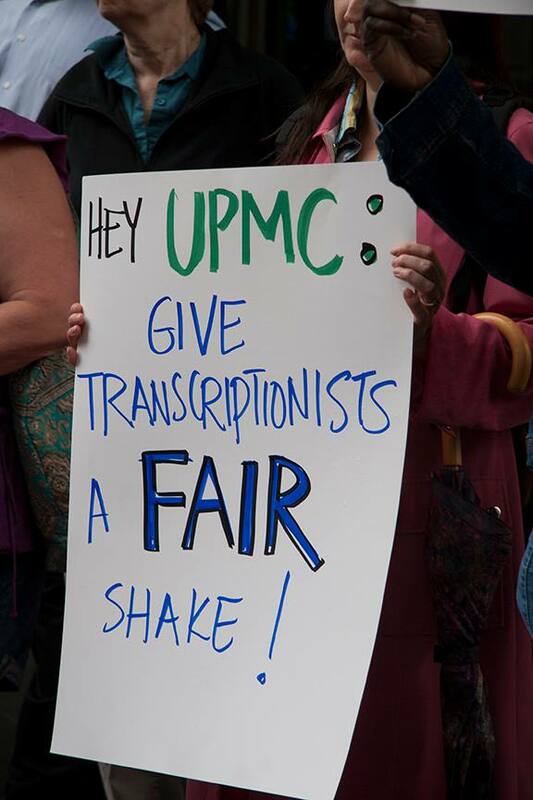 As you may remember, last year UPMC outsourced our good transcriptionist jobs to a private contractor, Nuance Communications, which pays poverty-rate wages- just pennies per line – even though we were working for the same hospitals and doctors and doing the same skilled work! I went from making $17.81 an hour to minimum wage. Our new pay was so low, many of us had to sell our belongings and move in with relatives to keep our families off the streets. I had to dip into retirement savings to pay the bills. UPMC wanted to be sure that we would take this massive pay cut but not lose our experience and skill. So when they laid us off, they told us we wouldn’t be eligible for unemployment benefits. No income while we tried to regroup and find jobs to support our families. No choice but to do the same work for half the pay. After months of hearings and hassles, the Unemployment Compensation Board of Review recently sided with us and said we have every right to these benefits. That means thousands of dollars for people who UPMC said it owed nothing. I am so happy you were able to achieve this goal! I work in this field and know it is a dying field, but it is dying because we are being forced into these horrible jobs that barely pay minimum wage, yet this is SKILLED EMPLOYMENT! You cannot just graduate high school and become a medical transcriptionist (at least, not a good, efficient, and competent one). Yet with companies such as Nuance feeding these hospitals and hospital systems lies about their work and how much they can save them, even telling them that they will absorb their employees and they won’t have to even pay them unemployment, yet the transcriptionists end up going from making a decent wage to less than what your local 16-year-old bagger at the grocery store makes. What the general public isn’t aware of is that companies like Nuance are outsourcing the work to their sister company, Nuance India, who then often outsources the work to smaller companies, or even independent individuals in India who then transcribe the work, send it back, all under the guise that it’s saved the company money. But does HIPAA apply to a transcriptionist in India? Even if they’ve signed contracts that they’ll abide by those rules, how can they be enforced? How can it even be verified? Are we sending HIPAA compliance officers to India? Too bad MTs all over the country can’t see the value of banding together to reverse the awful trends in compensation that they’ve suffered over the past 10-15 years.